We're not convinced the Reso 7 is revolutionary, but it is still an excellent head achieving largely what is claimed. Not quite as revolutionary as Evans claims. Price. 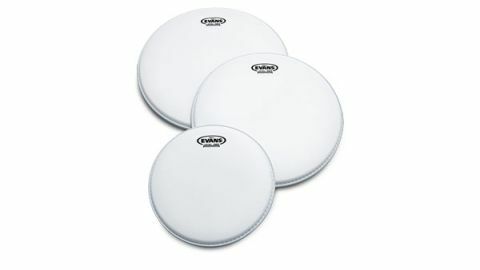 When it comes to tuning, drummers are increasingly aware that bottom heads are their un-doing and that due to the inconvenience of reaching them they are often neglected. Evans draws attention to this with the lightweight Reso 7, Evans' first ever coated resonant head, claiming it "provides drummers with a solution for shorter sustain without the need for additional muffling devices". A thinner head should have more ping, but less sustain. Accordingly, the Reso 7 is a single ply of 7-mil Mylar. Seven mil is 0.007" (700 film gauge). For perspective, an Evans G1 batter is a single-ply 10-mil. The Reso 7 is also coated, which further shortens sustain and increases warmth. "The Reso 7 benefits from Evans' Level 360 collar, which has a slightly steepened profile ensuring the flat of the head sits easily on the bearing edge"
We were sent 10", 13", 14" and 16" heads. Straightaway, on a 14"x14" tom the head seems subdued, needing extra tension to get an edge ping and a relatively boxy centre sound where the main sustain drops off quickly if you tap the head. So from medium tension upwards there is a lively edge resonance (you don't want a completely dead drum! ), while the shortening of sustain occurs mostly in the centre. This effect was slightly less noticeable on a 16"x16", but even more useful as these bigger drums are notoriously uncontrollable, creating havoc with low-frequency humming. With a coated 10-mil batter you can hear the top sustain while resonance is definitely controlled beneath. It won't completely eliminate the need for some top head damping on occasions though. At the opposite extreme, with a 10"x8", the problem is we want as much sustain as possible and the Reso 7 seemed slightly to inhibit it. Better for recording/ miking perhaps? Now here we must mention that Remo's 7.5-mil Diplomat heads have long been popular as resonants and that 7.5-mil is mighty close to the Reso's 7-mil. But the Evans coating looks thicker and that might well make a significant difference. The Reso 7 also benefits from Evans' Level 360 collar, which has a slightly steepened profile ensuring the flat of the head sits easily on the bearing edge. Again, good on Evans for always seeking to improve, but we're not yet convinced it's that revolutionary. Some undersized shells (Premier, Sonor, etc) are designed to address this already. A head will sit evenly if it is itself accurately true and if the bearing edge is level. We found little difference in the way other quality heads sit on a good bearing edge, even if the collar is slightly more rounded. The curve is pulled out as soon as tension is applied and you could argue that a rounded collar is more likely to adapt than one with a sharper fold. None of which makes any difference to the fact that the Reso 7 is an excellent head which we happily recommend. We just find those whopping claims hard to swallow.